Clyde Jackson Browne (born October 9, 1948) is an American singer-songwriter and musician who has sold over 18 million albums in the United States alone. Coming to prominence in the 1970s, Browne has written and recorded songs such as "These Days", "The Pretender", "Running On Empty", "Lawyers in Love", "Doctor My Eyes", "Take It Easy", "For a Rocker", and "Somebody's Baby". In 2004, he was inducted into the Rock and Roll Hall of Fame in Cleveland, Ohio, as well as bestowed an Honorary Doctorate of Music by Occidental College in Los Angeles, California. Biography edit: Early life edit: Browne was born in Heidelberg, Germany, where his father, Clyde Jack Browne, an American serviceman, was stationed for his job assignment with the Stars and Stripes newspaper. Browne's mother, Beatrice Amanda (née Dahl), was a Minnesota native of Norwegian ancestry. Browne has three siblings. Roberta "Berbie" Browne was born in 1946 in Nuernberg, Germany (Nuremberg); and Edward Severin Browne was born in 1949 in Frankfurt am Main, Germany. His younger sister, Gracie Browne, was born a number of years later. Browne moved to the Highland Park district of Los Angeles, California, at the age of 3 and in his teens began singing folk music in local venues like the Ash Grove and The Troubador Club. He attended Sunny Hills High School in Fullerton, California, graduating in 1966 as Clyde J. Browne. Songwriter for others edit: After moving to Greenwich Village, New York, in early 1966, Browne joined the Nitty Gritty Dirt Band, performing at the Golden Bear (Huntington Beach, California) where they opened for The Lovin' Spoonful. The band later recorded a number of Browne's songs, including "These Days", "Holding", and "Shadow Dream Song". Browne also spent a short amount of time in his friend Pamela Polland's band, Gentle Soul. Before Browne's 18th birthday, he became a staff writer for Elektra Records' publishing company, Nina Music, reporting on musical events in New York City with his friends Greg Copeland and Adam Saylor. He spent the remainder of 1967 and 1968 in Greenwich Village, New York, where he backed Tim Buckley and German singer Nico of the Velvet Underground. In 1967 Browne and Nico were romantically linked and he became a significant contributor to her debut album, Chelsea Girl, writing and playing guitar on several of the songs (including "These Days"). After leaving New York City, Browne formed a folk band with Ned Doheny and Jack Wilce, and settled in Southern California. Browne's first songs, such as "Shadow Dream Song" and "These Days", were recorded by the Nitty Gritty Dirt Band, Tom Rush, Nico, Steve Noonan, Gregg Allman, Joan Baez, the Eagles, Linda Ronstadt, the Byrds, and others. Browne did not release his own version of many of these early songs himself until years later. Soon after this, Rolling Stone mentioned Browne as a "new face to look for" and praised his "mind-boggling melodies". Classic period edit: In 1971, Browne signed with his manager David Geffen's Asylum Records and released Jackson Browne (1972), which included the piano-driven "Doctor My Eyes", which entered the Top Ten in the US singles chart. "Rock Me On the Water", from the same album, also gained considerable radio airplay, while "Jamaica Say You Will" and "Song for Adam" (written about Saylor's death) helped establish Browne's reputation. Touring to promote the album, he shared the bill with Linda Ronstadt and Joni Mitchell. His next album, For Everyman (1973) -- while considered of high quality -- was less successful than his debut album, although it still sold a million copies. The upbeat "Take It Easy", co-written with The Eagles' Glenn Frey, had already been a major success for that group, while his own recording of "These Days" reflected a sound representing Browne's angst. Late for the Sky (1974) consolidated Browne's fan base, and the album peaked at #14 on the Billboard album chart, the 84th best-selling album of 1974. Browne's work began to demonstrate a reputation for memorable melody, insightful (and often very personal) lyrics, and a talent for his arrangements in composition. It featured a Magritte-inspired cover. Highlights included the title song, the elegiac "For a Dancer," "Before the Deluge" and the often-covered "Fountain of Sorrow." The arrangements featured the violin and guitar of David Lindley, Jai Winding's piano, and the harmonies of Doug Haywood. The title track was also featured in Martin Scorsese's film Taxi Driver. During this period, Browne began his fractious but lifelong professional relationship with singer-songwriter Warren Zevon, mentoring Zevon's first two Asylum albums through the studio as a producer (working closely with Waddy Wachtel and Jorge Calderón). Browne's character was even more apparent in his next album, The Pretender. It was released during 1976, after the suicide of his first wife, Phyllis Major. The album features production by Jon Landau and a mixture of styles, ranging from the Mariachi-inspired "Linda Paloma" to the country-driven "Your Bright Baby Blues" to the downbeat "Sleep's Dark and Silent Gate". "Here Come Those Tears Again" was cowritten with Nancy Farnsworth, the mother of Browne's wife, after the untimely death of her daughter. Browne began recording his next LP while on tour, and Running on Empty (1977) became his biggest commercial success. Breaking the usual conventions for a live album, Browne used new material and combined live concert performances with recordings made on buses, in hotel rooms, and back stage.Running on Empty contains many of his most popular songs, such as the title track, "The Road" (written and recorded in 1972 by Danny O'Keefe), "Rosie", and "The Load-Out/Stay" (Browne's send-off to his concert audiences and roadies) although none had been recorded previously. Activism and music edit: In spring of 1978 Browne appeared at the site of the Barnwell, South Carolina nuclear reprocessing plant to perform a free concert the night before a civil disobedience action. He did not participate in the action. He likewise performed on the grounds of the Seabrook Station Nuclear Power Plant construction site in New Hampshire, where 1,414 people were arrested in the course of a multi-day occupation in April 1978; one of the two reactors at Seabrook were eventually constructed and has operated for over 20 years. Soon after the Three Mile Island nuclear accident, during March 1979, Browne joined with several musician friends to found the anti-nuclear organization Musicians United for Safe Energy. He was arrested protesting against the Diablo Canyon Power Plant near San Luis Obispo. His next album, Hold Out (1980), was commercially successful -- his only Number 1 record on the U.S. pop albums chart. The next year he released the single "Somebody's Baby" from the Fast Times at Ridgemont High soundtrack, which became his biggest hit, peaking at Number 7 on the Billboard Hot 100. The 1983 Lawyers in Love followed, signaling a discernible change from the personal to the political in his lyrics. In 1985 he sang a duet with Clarence Clemons in a song called "You're a Friend of Mine". Political protest came to the fore in Browne's music in the 1986 album, Lives in the Balance, an explicit condemnation of Reaganism and U.S. policy in Central America. Flavored with new instrumental textures, it was a huge success with many Browne fans, though not with mainstream audiences. The title track, "Lives in the Balance", with its Andean pan pipes -- and lines like, "There's a shadow on the faces / Of the men who fan the flames / Of the wars that are fought in places / Where we can't even say the names" -- was an outcry against U.S.-backed wars in Nicaragua, El Salvador, and Guatemala. The song was used at several points in the award-winning 1987 PBS documentary, The Secret Government: The Constitution in Crisis, by journalist Bill Moyers, and was part of the soundtrack of Stone's War, a 1986 Miami Vice episode focusing on American involvement in Central America. During the 1980s, Browne performed frequently at benefit concerts for causes he believed in, including Farm Aid; Amnesty International (making several appearances on the 1986 A Conspiracy of Hope Tour); post-Somoza, revolutionary Nicaragua; and the Christic Institute. The album World in Motion, released during 1989, contains a cover of Steve Van Zandt's "I am a Patriot," a song which he has performed at numerous concerts. Browne also performed alongside Roy Orbison in A Black and White Night in 1988 along with Bruce Springsteen, k.d. lang and many others. Originally airing on Cinemax, a live album and video recordings were also released. 1990s edit: In 1993, four years after his previous album, Browne returned with I'm Alive, a critically acclaimed album with a more personal style that did not have any successful singles but still sold respectably -- indeed, the ninth track from the album, "Sky Blue and Black", was used during the pilot episode of the situation comedy Friends. In 1994, Browne collaborated with Kathy Mattea to contribute "Rock Me On the Water" to the AIDS benefit album Red Hot + Country produced by the Red Hot Organization. During 1995, he performed in The Wizard of Oz in Concert: Dreams Come True a musical performance of the popular story at Lincoln Center to benefit the Children's Defense Fund. The performance was originally broadcast on Turner Network Television (TNT), and issued on CD and video in 1996. He sang a duet with Jann Arden, "Unloved", on her 1995 album Living Under June. Browne's own album, Looking East (1996), was released soon after, but was not as successful commercially. 2000 to the present edit: Browne released his album The Naked Ride Home in 2002, with a performance on Austin City Limits, featuring the recording with older familiar songs. During 2003, Browne guest-starred as himself in The Simpsons episode "Brake My Wife, Please," performing a parody of his song "Rosie" with lyrics altered to reference the plot involving Homer and Marge. In 2004, Browne was inducted into the Rock and Roll Hall of Fame. Bruce Springsteen gave the induction speech, commenting to Browne that although the Eagles were inducted first, he said, "You wrote the songs they wished they had written". Browne had written an uncounted number of hit songs that many artists, including the Eagles and Springsteen himself, had recorded over the span of his career. The previous year, three of Browne's albums -- For Everyman, Late for the Sky, and The Pretender -- had been selected by Rolling Stone magazine as among its choices for the 500 best albums of all time. A liberal Democrat, Browne appeared in several rallies for presidential candidate Ralph Nader in 2000, singing "I Am a Patriot" and other songs. He participated in the Vote for Change tour during October 2004, playing a series of concerts in American swing states. These concerts were organized by MoveOn.org to mobilize people to vote for John Kerry in the presidential election. Browne appeared with Bonnie Raitt and Keb' Mo', and once with Bruce Springsteen. During late 2006, Browne performed with Michael Stanley and J. D. Souther at a fundraiser for Democratic candidates in Ohio. For the 2008 Presidential Election, he endorsed John Edwards for the Democratic Presidential Nomination and performed at some of Edwards' appearances. After Barack Obama won the Democratic nomination, Browne endorsed him. Browne also performed briefly at the Occupy Wall Street presence at Zuccotti Park in Lower Manhattan on December 1, 2011, to show his support for their cause. Solo Acoustic, Vol. 1, was released in 2005 on Inside Recordings. The album consists of live recordings of 11 previously released tracks and "The Birds of St. Marks", a song that does not appear on any of Browne's studio albums. This album was nominated for a Grammy Award in 2007 in the category of Best Contemporary Folk/Americana Album. A live follow-up album, Solo Acoustic, Vol. 2, was released on March 4, 2008. Browne is part of the No Nukes group which is against the expansion of nuclear power. During 2007, the group recorded a music video of a new version of the Buffalo Springfield song "For What It's Worth". Browne cameoed in the 2007 film, Walk Hard: The Dewey Cox Story. Browne's studio album, Time the Conqueror, was released September 23, 2008 via Inside Recordings. The album reached the Billboard 200 album chart at #20, which was his first top 20 record since releasing Lawyers in Love in 1983. In addition, the album peaked at #2 on the Billboard Independent Album chart. During August 2008, Browne sued John McCain, the Ohio Republican Party, and the Republican National Committee for using his 1977 hit, "Running on Empty," in an attack advertisement against Barack Obama without his permission. In July 2009, the matter was settled under an undisclosed financial agreement with an apology from the McCain campaign and other parties. During August 2008, he appeared on the ALMA Awards in a taped interview honoring Trailblazer Award recipient and long-time friend, Linda Ronstadt. On 31 May 2008, Jackson Browne performed at the Artist for the Arts Foundation benefit at Barnum Hall, Santa Monica High School, Santa Monica, California. Performing live, alongside Heart, Venice ("Crazy On You") and over 70 members of the Santa Monica High School (SaMoHi) Orchestra and Girls Choir ("Bohemian Rhapsody"), the benefit helped to provide funds for the continuation of music education in public schools. The event was filmed and recorded by Touring Video and Post by On the WAVE Productions. Browne again performed there with Heart and other musician guest stars in 2009. In January 2011, Browne won the 10th Annual Independent Music Awards in the Best Live Performance Album category for Love Is Strange: En Vivo Con Tino, performed by himself and David Lindley. Browne contributed a cover of Buddy Holly's "True Love Ways" for a 2011 tribute album, Listen to Me: Buddy Holly. Personal life edit: Browne has been married twice and has two children. His first wife was actress/model Phyllis Major (1946-1976). The two began their relationship around 1971, and married in late 1975, as memorialized in the song "Ready or Not." Their son, model/actor Ethan Zane Browne was born in 1973 at Cedars-Sinai Medical Center, and grew up in Los Angeles, CA. Jackson and six-month-old Ethan appeared together on the cover of "Rolling Stone" magazine in May 1974. Ethan Browne has worked as a model and had small parts in two movies: Raising Helen and Hackers. Browne was devastated when Major committed suicide by consuming an overdose of sleeping pills just a few months after they married, in March 1976, at the age of 30. Browne was married in January 1981 to Australian model Lynne Sweeney with whom he had a second son, Ryan Browne, born on January 28, 1982, who has been a bass player and singer in the band Sonny and the Sunsets since 2007. Browne and Sweeney were divorced in 1983, when he began dating actress Daryl Hannah. The relationship with Hannah ended in 1992. He has been with artist and environmental activist Dianna Cohen, and a co-founding member of the Plastic Pollution Coalition, since the mid-1990s. Environmental activism edit: This section requires expansion. (September 2008) Browne was one of the leaders of the anti-nuclear movement and founded Musicians United for Safe Energy with Bonnie Raitt and John Hall in 1979. He was also an active member of the Abalone Alliance and the Alliance for Survival. According to environmental activist Ed Begley, Jr., "He's got this big wind turbine, and his ranch is completely off the power grid", Begley said. "He's done all of it himself." Browne campaigns against the unnecessary use of water in plastic bottles and takes steps to reduce usage on his tours. He is part of the movement "Plastic Free Backstage". In April 2008, the Surf Industry Manufacturers Association (SIMA) gave Browne the honor of "Environmentalist of the Year". Browne received the Duke LEAF Award for Lifetime Environmental Achievement in the Fine Arts in 2010 for his environmental activism and efforts to make his tours more "green". Save Our Shores (SOS), an ocean advocacy group in California, honored Browne with their Ocean Hero Award on February 23, 2011. 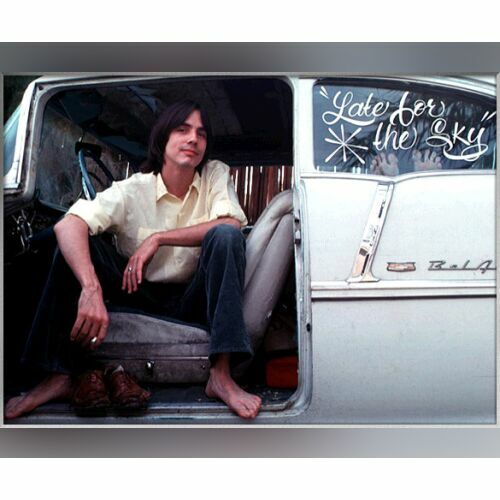 SOS and mayor of Santa Cruz, CA, Ryan Coonerty, proclaimed the date "Jackson Browne Day" in the City of Santa Cruz to honor Browne's social, environmental and anti-plastic activism, and as a founding member of the Plastic Pollution and an initiator of the REFUSE Disposable Plastics Campaign. Browne also attended the TEDx Great Pacific Garbage Patch conference, performing a new song, "If I Could Be Anywhere", which laments mankind's destruction of the earth and giving hope to activism. Charity edit: In April 2012 Browne performed for Artists for the Arts (AFTA) benefit along with Glen Phillips of Toad the Wet Sprocket and the band Venice. The benefit was to keep Arts and Music in public schools funded and raised over $100,000.00 at that event. This was Jackson Browne's fifth appearance out of the nine annual shows that have taken place. Harry Rabin of On the Wave Productions produced the show's live HD 12 camera shoot for the benefit. Marty Carrillo MC'd along with Cynthia Fox of KLOS. The band Venice was the main act and performed all supporting music for the guest artists along with a student orchestra and choir from the Santa Monica High and Malibu High school districts. The concert was held at Barnum Hall and was a sold out event. In 2008, Browne contributed to the album Songs for Tibet, an initiative to support Dalai Lama Tenzin Gyatso, and to publicize the human rights situation in Tibet. The album was issued on August 5 via iTunes and on August 19 in music stores around the world. Browne covered John Lennon's "Oh My Love" to benefit Amnesty International's campaign to alleviate the crisis in Darfur. The song appears on the album Instant Karma: The Amnesty International Campaign to Save Darfur, which was released on June 12, 2007 and features many other prominent artists performing other John Lennon covers, such as R.E.M., Jack Johnson, U2, Avril Lavigne, Green Day, and The Black Eyed Peas. Browne performed live and recorded The Beatles song medley "Golden Slumbers/Carry That Weight" in 1991 with Jennifer Warnes for the charity album For Our Children to benefit the Pediatrics AIDS Foundation. Browne and Warnes again performed it live for the Tucson, AZ benefit concert. Browne performed and sang the role of the Scarecrow in The Wizard of Oz in Concert: Dreams Come True, a 1995 musical performance for charity alongside Roger Daltrey, Natalie Cole, Tim Allen, and other stars. The celebrity cast performed a reader's theatre and songs styled performance of the MGM film The Wizard of Oz"" at the Lincoln Center as a benefit for the Children's Defense Fund. VHS and CD recordings were released of the concert in 1996 by Rhino Records. Browne covered Lowen & Navarro's "Weight of the World" on Keep The Light Alive: Celebrating The Music of Lowen & Navarro. The proceeds of the album benefit The Eric Lowen Trust, ALS Association Greater Los Angeles, and Augie's Quest. Browne also held a benefit concert for the Rory David Deutsch Foundation which is dedicated to providing funding for brain tumor research and treatment. In October 2010 Browne performed at both days of the 24th Annual Bridge School Benefit Concert, a yearly fundraiser established by Neil Young. The Bridge School assists children with severe physical impairments and complex communication needs. Browne also appeared at the 2010 NAMM Conference in Anaheim, California with Yoko Ono and Quincy Jones in support of the John Lennon Educational Tour Bus. On March 10, 2011 Jackson Browne with David Crosby, Graham Nash, Alice Cooper, and others performed a benefit concert in Tucson, Arizona benefiting The Fund For Civility, Respect, and Understanding, a foundation that raises awareness about and provides medical prevention and treatment services to people with mental disorders. The concert also benefited victims of the January 8, 2011 shootings in Tucson, AZ. Browne has continued to provide exclusive music tracks for various charity and benefit albums including Safety Harbor Kids Holiday Collection (where he sang the Johnny Marks holiday song "Silver and Gold" with longtime friend Lowell George's daughter, Inara George). Browne provided a live version of "Drums of War" for The People Speak Soundtrack. Other charity albums he has contributed to include: Acordes Con Leonard Cohen (song: "A Thousand Kisses Deep"), From Wharf Rats to Lords of the Docks Soundtrack (song: "Step By Step"), Shrink (the Kevin Spacey film Soundtrack) (song: "Here"), Keep the Light Alive: Celebrating the Music of Eric Lowen and Dan Navarro (song: "Weight of the World"), and 1% For The Planet: The Music, Vol. 1 (a live version of "About My Imagination"), as well as many benefit concert and other appearances. Awards edit: On March 14, 2004, Browne was inducted into the Rock and Roll Hall of Fame by Bruce Springsteen, and on June 7, 2007 Jackson Browne was inducted into the Songwriters Hall of Fame. In 2004, Jackson was named an honorary Doctorate of Music by Occidental College in Los Angeles, for "a remarkable musical career that has successfully combined an intensely personal artistry with a broader vision of social justice." For "promoting peace and justice through his music and his unrelenting support for that which promotes nonviolent solutions to problems both nationally and internationally", Browne received the Courage of Conscience Awards from The Peace Abbey in Sherborn, Massachusetts. In 2007, he was awarded the Chapin-World Hunger Year Harry Chapin Humanitarian Award. In 2008, Browne received the NARM Harry Chapin Humanitarian Award. In 2002, Browne received the John Steinbeck Award, given to artists who exemplify the environmental and social values that Steinbeck believed in.